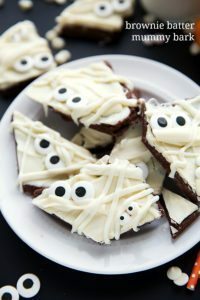 A super easy triple-chocolate “mummy” milano cookie. 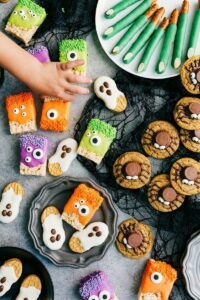 These cookies are the perfect treat to bring to a Halloween party! 2 layers of chocolate + 1 layer of white chocolate = a super delicious treat! Did I mention these take about 10 minutes to make? 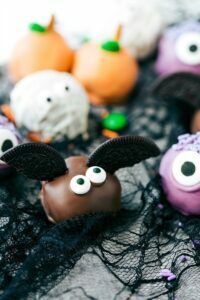 If you are in a pinch for a Halloween treat, these fit the bill! I bought the double-chocolate Milanos (hence the 2 layers or chocolate) and it perfectly balanced the thick coating of white chocolate. These are incredibly delicious! 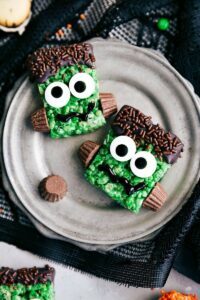 At first, I was just dipping and making them as a cute and easy Halloween treat (without really thinking about how they would taste), but after one bite of these they ended up being one of my favorite tasting Halloween treats. I mean, of course I didn’t want a gross Halloween treat no matter how cute it looked, but I didn’t know it would be SO GOOD. White chocolate mixed with dark or milk chocolate has always been a weakness of mine! Pretty much all you have to do to make these is melt some white chocolate. I use vegetable oil to thin out the chocolate and help it to melt better, but you could also use shortening. When melting white chocolate, I have found the most success in the microwave. That said, it can be burned and ruined very easily. If you are patient and stir frequently, you can save it from being burned. I like to microwave it for 30 seconds and then stir for at least 30 seconds. A lot of melting will happen outside of the microwave, it just requires patience for that melting to happen. If it starts to harden while you are dipping, just microwave it for another 5-10 seconds and add a little bit more vegetable oil if needed. 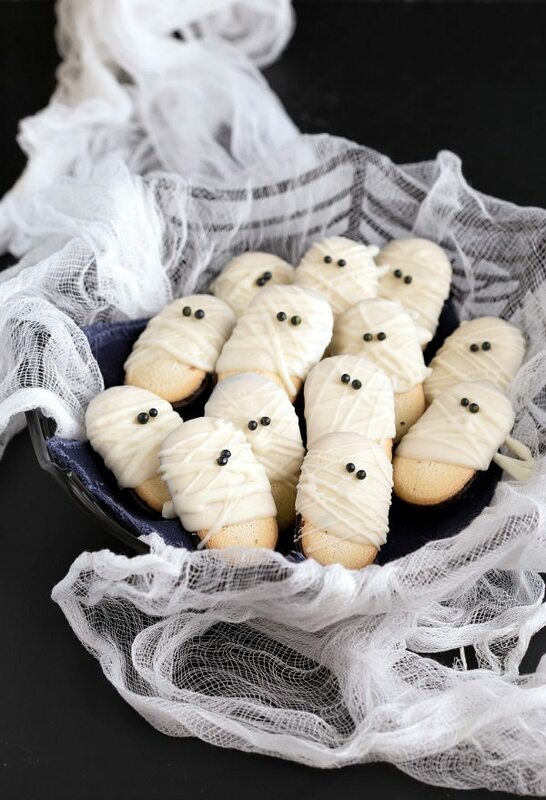 After all the cookies have been dipped in the chocolate and are laying on some parchment paper to harden, you’ll want to transfer the remaining white chocolate into a small plastic bag (or a frosting bag with a #2 tip). Cut the tip off of the plastic bag and pipe away on these mummies! I just did it really quick and kind of messy because it gives them more character! Before that white chocolate has a chance to harden, place two little sprinkle “eyes” on these guys! Open the package of cookies and pull them all out. Since white chocolate hardens so quickly, I like to work in several batches. In a microwave safe bowl place 1/2 cup of white chocolate chips with 1/4 tablespoon vegetable oil in the microwave. Lightly tap the cookies on the edge of the bowl to get a nice even coating of chocolate. Repeat in another batch with remaining cookies. 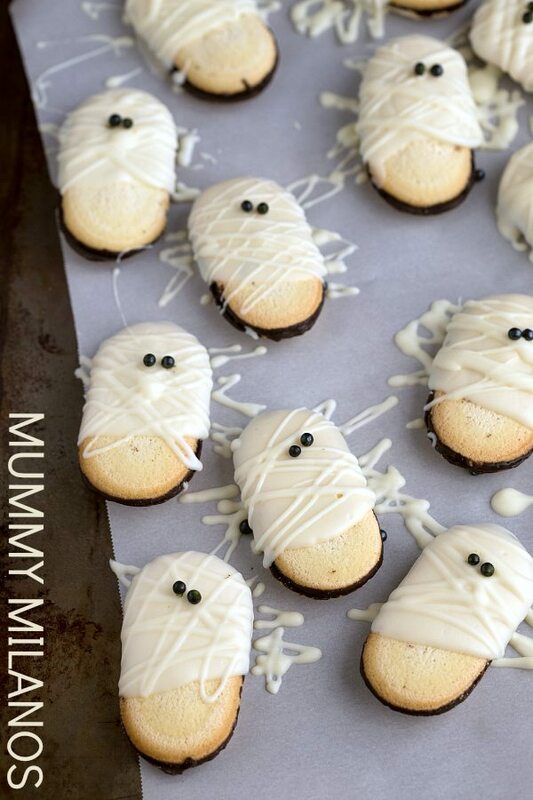 These festive mummy Milanos are so cute and creative! 🙂 Luv the little eyes and the sprinkles used for them!! OMIGOSH ALL THE CUTIE PIIIIIES! love em!!! Oh my goodness! 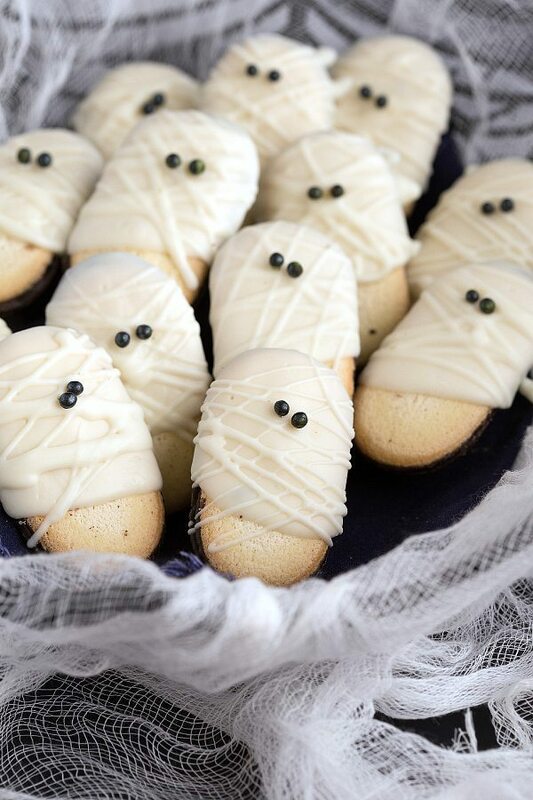 Milanos are my favorite and you just made them so cute!! Plus the princess/lobster party is great too!! The cutest mummies I’ve ever seen! These are adorable Chelsea! Love how simple it is and quick to come together! 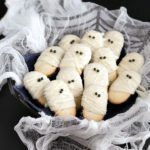 Even though Halloween is not that big here in Australia, I definitely will be making these mummy cookies – they look so cute and delicious! These are super cute! Very creative!! Chelsea, these are so darling! 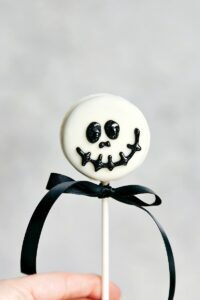 I especially love the wee little sprinkles for eyes–they make the whole look! I tried to make these and am finding that the brown chocolate on the milano started to melt and contaminate the white chocolate. Did you have this issue and what did you do to fix it? 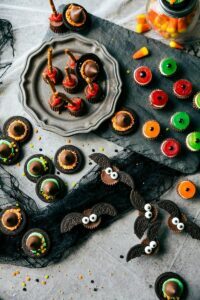 These might actually be the all-time cutest Halloween treats i’ve ever seen!